The Miss Tibet Pageant 2011, the 10th anniversary, was held from 3 to 5 June 2011 in Dharamshala, India. The seven rounds of competitions started from 3 June with the Swimsuit Round. The Talk and Talent Rounds were held on the 4th. The Finale Night, 5 June, had the Introduction, Evening Gown, Traditional Costume, and Interview Rounds. The Finale Night was held at the Tibetan Institute of Performing Arts (TIPA), Mcleod Ganj. Coronation for the new Miss Tibet, the 10th winner of the pageant, took place on the Finale Night with the presentation of 100,000 rupees (2,250 USD approx). The first runner-up received 50,000 rupees and second runner-up received 25,000 rupees. configured not to display inline frames. The 2011 contestants went through a one-week training session starting from the 27th. They listened to talks given by Tibetan experts such as Tenzin Wangdu from Sambhota Tibetan Schools Society, Tsewang Chondhen the musician, Tsering Choedup of International Tibet Network, Phuntsok Chomphel of Choice (an HIV-AIDs Initiative), and Tenzin Norgay of Tibetan Centre for Human Rights and Democracy. They also spent time with Ama Adhe, the famous ex-political prisoner, the staff members of the Tibetan Women’s Association, and others. They have been doing yoga, and learning a dance sequence from two artistes Namkhang Lhamo and Tenzin Yangdon of the Tibetan Institute of Performing Arts. The 2011 contestants reached McLeod Ganj on 26th of May, and were announced on 27 May. This year's Miss Photogenic was Tenzin Yangkyi. MCLEOD GANJ, India, 1 December 2011, Lobsang Wangyal The Miss Tibet Pageant 2012 will be held in Dharamshala, India, from 8 to 10 June 2012. The application will be online from 1 December 2011 till the end of March 2012. ZURICH, Switzerland, 24 October 2011, Tenzin Yangkyi When I came to South Korea I was focused on winning the beauty pageant (Miss Asia Pacific World 2011). I wanted to do proud for my country — Tibet. I had lots of fun with all the contestants. INCHEON, South Korea, 6 October 2011, Tenzin Yangkyi I landed in Seoul, South Korea, on 1 October. My first roommate was Miss Mali from Africa. I am now sharing a room with Miss Thailand. 3 November 2011, ON THE WEB Endlich kann Tenzin Yangkyi (18) wieder in ihrem eigenen Bett schlafen. Seit ihrer Wahl zur «Miss Tibet» war sie nicht mehr oft in ihrer Wohnung bei Winterthur ZH. 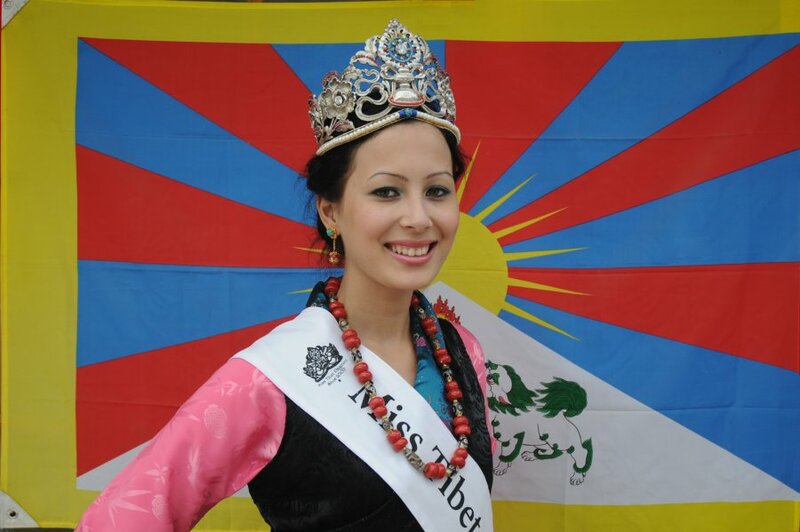 6 August 2011, MCLEOD GANJ, India To raise Tibet's voice at international forums, Tenzin Yangkyi, who was crowned Miss Tibet 2011, would represent the country at the "Miss Young International" and "Miss Asia Pacific World" contests this year. But scarcity of funds is the main obstacle in Yangkyi's way to success. 10 June 2011, ON THE WEB What do you do when people keep telling you your country’s not a real country? If you’re Lobsang Wangyal, you bankrupt yourself throwing the saddest beauty pageant in the world. Good job and sound media, but the name of Miss Tibet should be full of heart for the Tibetan issue and have true beauty of inner mind … not only an outside of skin changing to wrinkles. We all in the name of Tibet will never like to see one crowned who is in mortal body selfish, jealous, with no idea of religion and neglecting Tibetan inner values. Think well and please let our nation have a better coming Miss Tibet ahead..
i think miss yangkyi is very beautiful but as compare to ,my girl friend she is just a fake one i m saying this lines through ur comment box why because these days she is not with me and i m missing her alot so through this way i can convey my message that HOW MUCH I LOVE HER? hope she read this one and thanks to u for giving me the chance to let my inner feelings flow!!!!!!!!!!!!!!!!! Amanda I love you very much and wish you much success in the Miss Asia Pacific Pageant. You have grown into a beautiful woman. I am very proud of you. Your Dad in Switzerland misses you very much. i think we have make sure the watch is the good watch. If it is bad then we have to write something for Miss Tibet. And also, the Miss Tibet is really good for Tibet as a country, because many people don’t even know who is Tibet. || We’re sorry – this comment could not be posted. || Criticism is good, but YELLING and empty words are not. || —> 1. Change ALL CAPS words to lowercase. || and helps them have a discussion. If you are playing politic( please dont use Miss Tibet0 better use another like miss mecloed or shambala or etc. i heard that you are selling Name of (Miss Tibet)? how much you will cost and what formalate do you need? What time and where exactly (the venue) are the different rounds going to take place? Me and some friends were thinking of visiting Dharamshala during the weekend of the Miss Tibet competition to show some support to the brave Tibetan beauties! I’m sure it’s going to be a fun! Please post venue and timing of each of the rounds… what time does each round start during and which venue? Thank You!!!! GO MISS TIBET!! the world is your stage… own it! What type of Tibetan lives in swistwrland ? Weill…. Go Acha Khechoe ! Do you mean Switzerland? In Switzerland there are Tibetans who are beautiful and intelligent. Tibetans who can write and spell right. And I’m sorry for your acha that she didn’t win. Dear Ngodup. Tashi Delek. do well and u can do it. Hearty Tashi Delek. Hello, Tashi Delek Miss Tibet 2011, Ngodhup la, the pageant of Miss Tibet 2011 should go toward you because you are the best qualified and suited that Pageant lo. Wish you good luck, see you fifth of June, ok.
What time and where exactly (the venue) are the different rounds going to take place? Me & some friends were thinking of visiting Dharamshala during the weekend of the Miss Tibet competition to show some support to the brave Tibetan beauties! I’m sure it’s going to be a fun! Please post venue and timing of each of the rounds..what time does each round start during & which venue? GO MISS TIBET!! the world is your stage..own it!